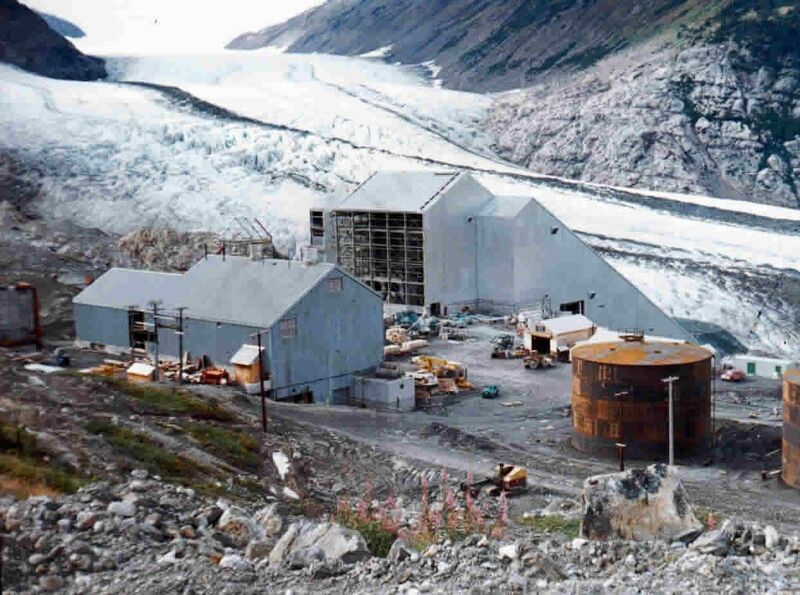 The Granduc copper mine was located at the headwaters of the Leduc River in the Skeena Mining Division of British Columbia, 25 miles north-northwest of Stewart, B. C., a town at the head of Portland Canal, a fjord-like body of water separating the southernmost part of the Alaska Panhandle from the Province of British Columbia. A view of the Granduc mill on the left under construction, the Power House is in the foreground and the Brendan Glacier in the background.The setting was awesome and, simply, magnificent. One was reminded of the observation of Dr. Samuel Johnson who, when asked to comment on the clarity of speech of a talking dog, said: "Sir, the wonder is not that he talks so well, but that he talks at all". In the same vein, the wonder of the Granduc orebody was not that it existed but that it was found in the first place. The further wonder is that in spite of the forbidding location, in spite of natural disaster, in spite of the necessity to advance construction work in the face of severe weather and 800-inch annual snowfalls, and in spite of man-made interruptions such as work stoppages, the courage and capital was found to push ahead with the development of the mine and the building of treatment facilities until operations were achieved on a tune-up basis in November 1970. The first shipment of concentrate was made in late January 1971. In early June 1971,"production was being maintained at approximately 5000 tons per day with feed from ore stock- piled on surface in addition to the ore from underground faces. Problems inherent to the start-up of any new mine and mill are being gradually and competently resolved and it is expected that rated capacity of 7500 tons per day will be achieved later this year. Provision has been made in the mill design to handle 9000 tons per day at a later date.